The Vermont senator zeroes in on a state that was not kind to him — or Democrats — in 2016. 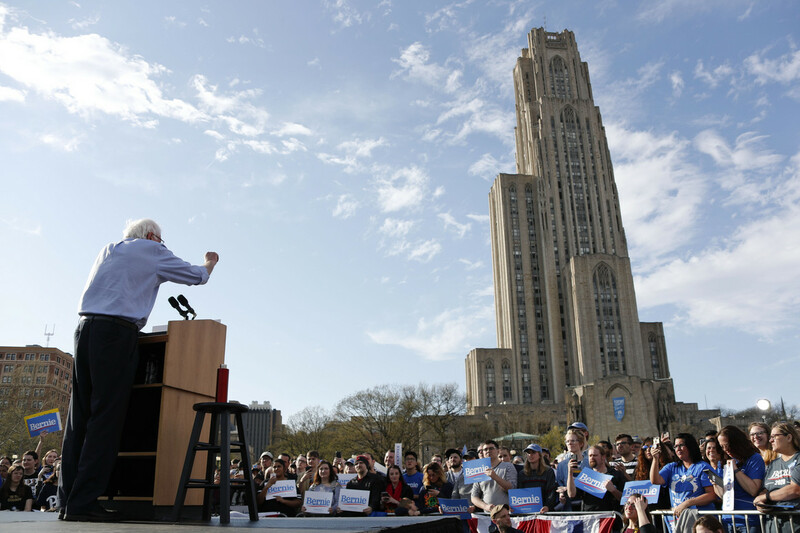 PITTSBURGH — Bernie Sanders’ fate in the Democratic primary depends on whether he can convince voters that a democratic socialist in his late 70s is the person most likely to defeat President Donald Trump in critical swing states like this one. Yet Pennsylvania could be one of the most challenging states in the Rust Belt for Sanders to make his case. While he can point to the fact that he won Michigan and Wisconsin in the 2016 primary before Trump carried them later that year, Sanders was crushed by Hillary Clinton in Pennsylvania. Meanwhile, Joe Biden, a former vice president and Scranton, Pa., native, looms. That difficult plight formed the backdrop of Sanders’ just-completed four-day swing through the industrial Midwest, designed to demonstrate that he can win back the states that delivered Trump the presidency. Sanders made abundantly clear that organized labor will be a linchpin of his strategy, as will his populist message on trade and health care. A campaign rally in Pittsburgh underscored the importance of unions to his pitch. Before Sanders took the stage, a labor organizer pumped up the crowd, telling them that the University of Pittsburgh profits “off the work of graduate students who struggle to pay their rent and afford food.” Later, the Vermont senator took the stage and endorsed the graduate assistants’ two-year campaign to form a union. Sanders zeroed in on labor throughout his sprint across the state. He spoke at a meeting held by the Pennsylvania Association of Staff Nurses and Allied Professionals and talked up his pro-union bona fides at a Fox News-hosted town hall held in the shadows of a former steel mill. A former worker at an Erie-based locomotives manufacturer that recently held a strike also spoke at Sanders’ Pittsburgh rally, which drew an estimated 4,500 people, according to his campaign. Sanders’ team repeatedly has called attention to the Erie workers, attempting to show that he understands the symbolic power of what the union described as the “first major U.S. manufacturing strike of the Trump era.” During a town hall on CNN earlier this year, Sanders admonished the manufacturing company for handing out lavish bonuses to executives while lowering wages. The leader of their union, United Electrical, Radio & Machine Workers of America Local 506 President Scott Slawson, also spoke at Sanders’ campaign kickoff rally in Brooklyn in March. Recent polls show that significant numbers of Democratic voters prefer a contender who can win over one who shares their ideology. If Biden jumps into the presidential race, Sanders will need to prove to voters that he’s better equipped to take on Trump in Pennsylvania than the fellow labor ally. Sanders will also likely need to show that he can win over moderates in the Philadelphia suburbs who were seen as critical to Democratic successes in the 2018 midterm elections. Sanders also campaigned in two other smaller Pennsylvania cities on the other side of the state, Wilkes-Barre and Bethlehem. Those destinations weren’t by chance: Both are in counties that voted for Trump after backing Barack Obama. Sanders also went on Trump’s favorite network, Fox News, for an hourlong town hall — which he dominated. In an April memo, Sanders’ campaign manager, Faiz Shakir, said Sanders is well-positioned in Pennsylvania, as well as in Michigan and Wisconsin, because of his platform on trade, health care and unions. That memo also boasted that Sanders received donations from more than 18,000 Pennsylvania residents so far this year. The Sanders campaign said Tuesday that 55,000 people in the state had signed up to volunteer to help him. In Pennsylvania, Sanders called on Trump ditch the new NAFTA agreement, which he said would hurt workers. He talked about his record of voting against free trade deals that he said have led companies to outsource jobs to other countries. And he attacked Trump for breaking promises to working-class voters by proposing to cut Medicare and Medicaid. On immigration, Sanders struck a moderate tone while in the state, advocating for “building proper facilities” on the U.S.-Mexico border and bringing on more judges to expedite the processing of migrants’ cases. Sanders’ trip to Pennsylvania also previewed the arrows headed his way. Val DiGiorgio, chairman of the state’s Republican Party, said in a statement that the Vermont senator’s policies would destroy jobs and hurt taxpayers’ pocketbooks.